John brought me back, though. 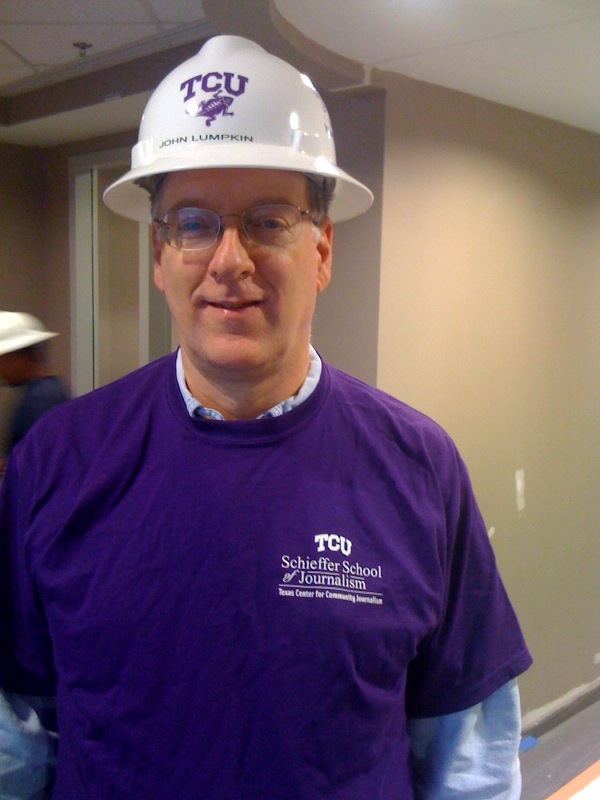 I toured construction of new facilities at the Schieffer School (with John Lumpkin’s hard hat) in a 2009 visit. John became director of the Schieffer School in 2009 after a long career with the Associated Press, where he became a vice president. We had crossed paths, or nearly so, in the 1980s, when he was in AP’s Des Moines bureau and I worked for the Des Moines Register. We knew who each other was, but we weren’t really friends. That began to change quickly. John invited me to TCU that fall to lead an ethics seminar and an innovation workshop. While I was there, he asked me to consult on updating journalism programs with the Schieffer School’s curriculum committee, which was preparing for evaluation by the Accreditation Council on Education in Journalism and Mass Communication (the school earned accreditation). My friendship with John grew over ribs at Angelo’s Bar-B-Que in Fort Worth and over dinners and drinks in Fort Worth and Washington over the next few years. I hosted TCU students spending a semester in the Schieffer School’s Washington program. I returned to campus for an APME NewsTrain program, to consult on updating student media, to provide digital-first training for student media and to train editors for TCU’s Texas Center for Community Journalism. The highlight of my renewed relationship with TCU was my selection in 2010 to the Schieffer School’s Hall of Excellence. In my repeated visits and other encounters with the Schieffer School, my admiration for John’s work has grown. He understands the importance and proper roles of administration, faculty, students, professional relationships, facilities and funding in maintaining a strong journalism school. He understands the need to stay current in turbulent times. John has earned every minute of leisure that lies ahead. I know he’ll be spending considerable time on the golf course, but I hope this is a semi-retirement, because journalism and education still need his contributions. Whatever lies ahead, I thank John for bringing me back to my alma mater, and I thank him for outstanding leadership of the Schieffer School.